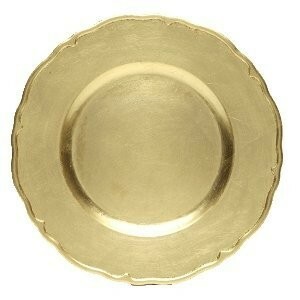 ChargeIt by Jay Gold Regency Round Charger Plate 13"
Home > Products > ChargeIt by Jay Gold Regency Round Charger Plate 13"
The detailed edge and elegant design of the ChargeIt by Jay Round Gold Regency Charger Plate 13" makes it a perfect decorative base for full course meals. This charger plate is an excellent piece for upscale weddings, birthday parties and a variety of other special occasions. The attractive and functional design of this charger plate, made of break-resistant melamine, will add a touch of sophistication to your guests' dining experience and help protect your table against spills and messes. A useful and versatile piece for hotels, catering companies and other food service facilities, this charger plate is a great addition to your dinnerware collection.